Catching up with former Ontario athletes can be a definite treat, especially if the athlete in question is three-time World champion and two-time Olympic silver medallist Elvis Stojko. Elvis is of course well-known to skating fans everywhere, but what you may not know is that off the ice, he is making a different kind of name for himself. Elvis is an actor and singer and is going to be featured in an episode of Murdoch Mysteries tonight, January 28, 2019 at 8:00pm local time on CBC. Soooooooo. Is Elvis a good guy or a bad guy? In terms of life: a good guy. Definitely. 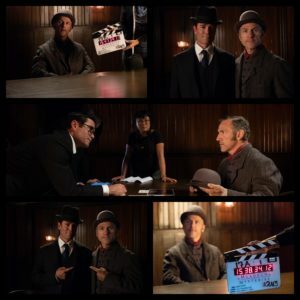 In terms of Murdoch Mysteries? As it turns out – a bad guy. If you want to see how this unfolds on screen, make sure to watch CBC tonight at 8:00pm and support one of Skate Ontario’s biggest legends. In the meantime, Elvis has shared some of the photos from the set.